Once climbers check in, it’s advisable to have a shower as soon as you can in the communal bathrooms. With more than 100 people staying at Laban Rata and its surrounding huts, you can imagine the showers get quite wet and soiled from weary, dirty trekkers. I took a regular hike this morning and went up one of the other local hills for a change. For the past two months I’ve been exclusively climbing around Xuan Van Hill (what I’ve been calling Gheng Rang until just discovering the real name). Today’s hike was just 6.4 kms of hiking over 3 hours, but there were lots of up-and-down stretches. The great thing about the hike is that it gave me a chance to try the poles out over new terrain. The thing is with trekking poles is that there is no single technique that you use. Rather, there are a variety of ways to use them depending on terrain and slope. Here, then, is a brief summary of the ways we can use them. Over relatively flat, well-defined trails have the poles set for medium length and use them to assist your hiking. Alternate the poles and your legs when walking: it feels more natural and it’s the easiest way to get into a rhythm. Shorten the poles when going uphill, lengthen… blah, blah, blah. You know the drill. I’ve found that for moderate uphill stretches planting the pole next to the foot takes a lot of pressure of legs and hips. For higher steps, rocks, logs and so on, double planting the poles and using them to haul you up works well. On uneven, rocky terrain, I don’t even worry about technique. I just plant the poles in suitable places as I go along, not worrying about rhythm. Keep your elbows close to your sides. This gives you better leverage as well as improving your pole placement accuracy. If your hands start to feel fatigued, it’s a sure sign that you are gripping the handles incorrectly. Hold the grips loosely, with just enough pressure to maintain control. Put your weight on the wrist straps, not the poles. One web site recommended resting your palms atop the grips when going downhill. I tried it several days ago on the steps and didn’t like it – I felt it was too hard to be precise when planting the poles. I tried again today and learned how to do it properly. The first time was a fairly steep downhill section, hard clay covered with tiny pea gravel. My traction was, to say the least, almost non-existent. I carefully planted the poles some distance in front of me, transferred my weight to the poles, then moved and planted my feet. It was slow but very effective – and safer. I used the same technique when I started following a rocky stream bed uphill. I ended up having to backtrack because it went the wrong way, but I learned that not only are poles useful when clambering up big rocks, they’re even better when making your way down. Again, the trick is move slowly and carefully. Without poles I normally lean back when going downhill; with poles, I lean forward with a significant amount of weight on my arms – and off my feet! Sometimes trekking poles just get in your way. Dense, overgrown tracks are one of these times. Carry or stow your poles until the trail opens up again. Rubber tips: there are times to use them and times to take them off. I use them on solid rock and concrete (for example, on my training steps) because they’re quieter, absorb shock and offer better grip when planting the pole. I take them off when I go off road and hit the dirt. I’m still on the learning curve, but they’re starting to become second nature. Like any skill, it takes practice. Becoming competent with poles before attempting Mt Kinabalu is a good move. By the way, Timpohon Gate is really a gate. You have to have a plastic ID badge to get passed. All climbers passing the gate must wear a badge. It’s got a nice photo of the mountain on the front with the text,”Welcome to Mt. Kinabalu, Take nothing but photographs and leave nothing but footprints”. You get to keep it too. It’s a nice keepsake from your trip. It looks great next to my certificate! After the hike I looked back at the “Welcome to Mt. Kinabalu” part and had the ironic thought that it was a lot like the “Welcome to Canada” sign painted on the cement wall at the exit of the fastest chicane at the Canadian F1 Grand Prix where everyone crashes spectacularly. Let’s talk about training for the Mt Kinabalu climb. 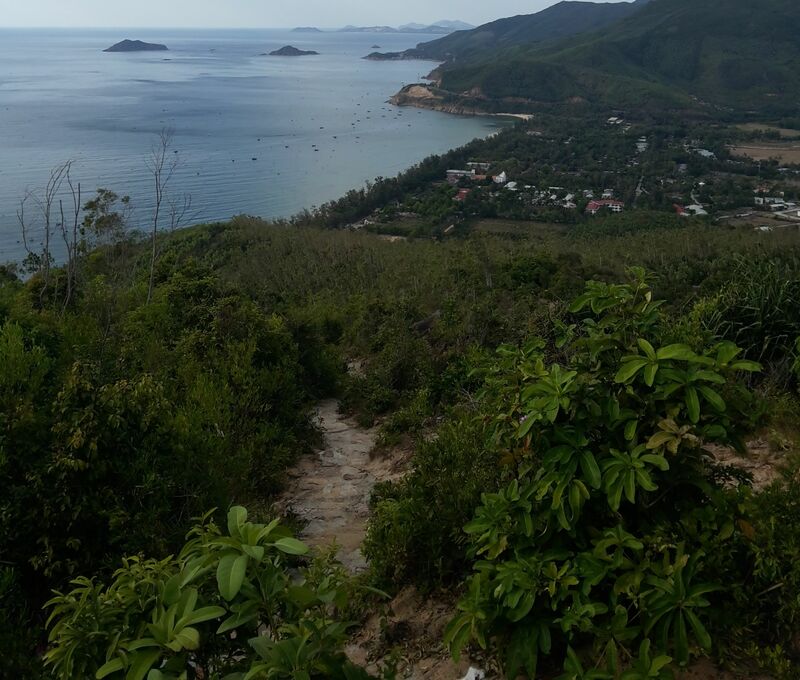 I’m quite lucky in Quy Nhon because it’s quite hilly along the coast here. In particular, there’s Gheng Rang Hill. This is a 230m high hill at the south end of the city with a path going to the top. The path consists of about 650m of steps and 150m of uphill path and the total altitude change is about 200m. This works out to a slope of 25%, slightly less than Mount Kinabalu’s 26% (8.7 km hike, 2,300m climb). I think it will provide pretty good training for Mt Kinabalu. There are, of course, some differences. On Mount Kinabalu it’s a continuous climb without any downhill stretches whereas on Gheng Rang Hill I get get regular rests by going back to the bottom. This makes a huge difference – I’m breathing deeply on the way up but breathing normally on the way down. I’m also coping with heat here, which isn’t a real problem on Kinabalu. And it doesn’t prep me for the altitude. Not much I can do about that, unless I tape my mouth shut and plug one nostril… The truth is that the only thing that preps you for climbing Mount Kinabalu is climbing Mount Kinabalu. Over the past month, I’ve been steadily increasing the intensity of my training. Two weeks ago, I scaled the hill four times and did it fairly easily – 800m of climbing and 6.4 kms distance in a bit over three hours. Although my legs felt a bit tired, there was no soreness or stiffness afterwards. Last week, I upped it to 5 laps and really struggled on the fifth climb. I mean, really struggled – I was starting to feel nauseous and overheated by the end of the fourth lap. I considered stopping for the day. However, I felt that if I couldn’t do one more puny little climb then I’d better not attempt Kinabalu. So, onwards and upwards. By the time I got home I was exhausted. It wasn’t at all like the previous week. I drank a litre of water, showered and crashed out for a nap. However, I woke thirty minutes later with excruciating cramping in my calves. Lack of salt, of course. I drank one of those performance drinks that was left in the fridge and I was fine shortly after. I sat down and thought about what I had done wrong. How did I screw up? Let me count the ways. The previous night I went out for a couple (well, three) beers after knocking off work in the evening. I got home at about ten and knowing that I had an early start for the hike the next morning went straight to bed. Without eating. I overslept slightly the next morning and got up at 5:00 instead of my planned 4 AM start, so I quickly packed my backpack with water and all my equipment and headed out the door. Without eating. That’s right, a 1,000 metre climb and 8 kilometre hike when I hadn’t eaten since lunch the day before. Stupid. Although we’re well into autumn here, it was a warmer than usual day. Quite warm, in fact, so the heat started getting to me. My late start didn’t help at all either. Even though I was feeling the heat – and the onset of mild heat stroke – by the end of the fourth lap, pride wouldn’t let me stop when I should have. Stupid. I brought along plenty of water (4 litres), but it wasn’t enough. This was mainly because most of the water bottles were frozen and I was drinking faster that it was melting. Stupid. I used plenty of sunscreen on my upper body and face, none on my legs. Stupid. And, of course, not replacing the salt I lost through perspiration. To be honest, though, this is the first time in my life I’ve had problems with cramping for this reason. Still, I think it qualifies as stupid. On the plus side, I was fine later in the day. No soreness, not particularly tired and in general I shaped up pretty well. For the record, I climbed (and descended) 1,000m and hiked 8 kms in four hours. That’s two-thirds of the way from Timpohon Gate to Laban Rata. And down again. So, earlier this week I acquired a brand new head-lamp. I got up at three AM yesterday morning, had a coffee and breakfast (a fruit shake with bananas, a mango, soy milk and yoghurt – yum! ), started at 4:00 am, carried 5 litres of water (three litres unfrozen)and a couple of bottles of Revive, and lubricated myself all over with sunscreen. And promised myself I would bail out if I started having problems. The head lamp worked well, a good clear light and comfortable to wear. However, I was climbing and descending much more slowly and carefully in the dark. The torch is no substitute for daylight. The trekking poles are a necessity. They make the ascent noticeably easier, and are worth their weight in gold going down the steps. I’ve discovered the limits of my fitness. My legs were stiff and sore last night and I’m not feeling too spry this morning either. Next week: seven ascents. This amounts to 1,400m of climbing, the same as Timpohon Gate to Laban Rata. At this rate, if anything stops me from completing the Kinabalu climb, it won’t be lack of fitness. 4Stroke signed us up for the 2D1N (two days, one night) package. According to the sample itinerary that Amazing Borneo supplies, we’ll be collected from our hotels early in the morning (6:30 AM) on day 1 and taken to Kinabalu Park Headquarters. That’s where we’ll register, get our permits and meet our guide. We’ll start off from Timpohon Gate mid-morning (9:30) and if all goes well will arrive at the Laban Rata Resthouse mid-afternoon (3:30). Relax and recover, have an early dinner and hit the sack early evening (6:30). Rise and shine at 2:00 AM the next morning, gear up, have a very early breakfast (they call it ‘supper’) and head off for the summit at 2:30 AM. If we can maintain a steady pace, we should be able to hit the peak in time to catch the sunrise – on 2Stroke’s sixtieth birthday. A quick toast will be in order, no doubt. 4Stroke suggested bringing a few cans of beer, but I reckon those little spirit bottles would work better. Lighter, for starters, and the truth is that alcohol, altitude and climbing don’t mix. Nobody wants to hang around the summit too long. It’s cold (around 0 degrees) and windy, and once you stop moving you start to get chilled. Back down to Laban Rata, breakfast and checkout (10:30) and then all the way back down to Timpohon Gate, arriving hopefullly by mid-afternoon. Transport will be available to take us back to Kota Kinabalu, so we should be back at our hotels by early evening. starts off quite humid, temperature drops a lot as we climb. At the end of August 4Stroke got back to us. 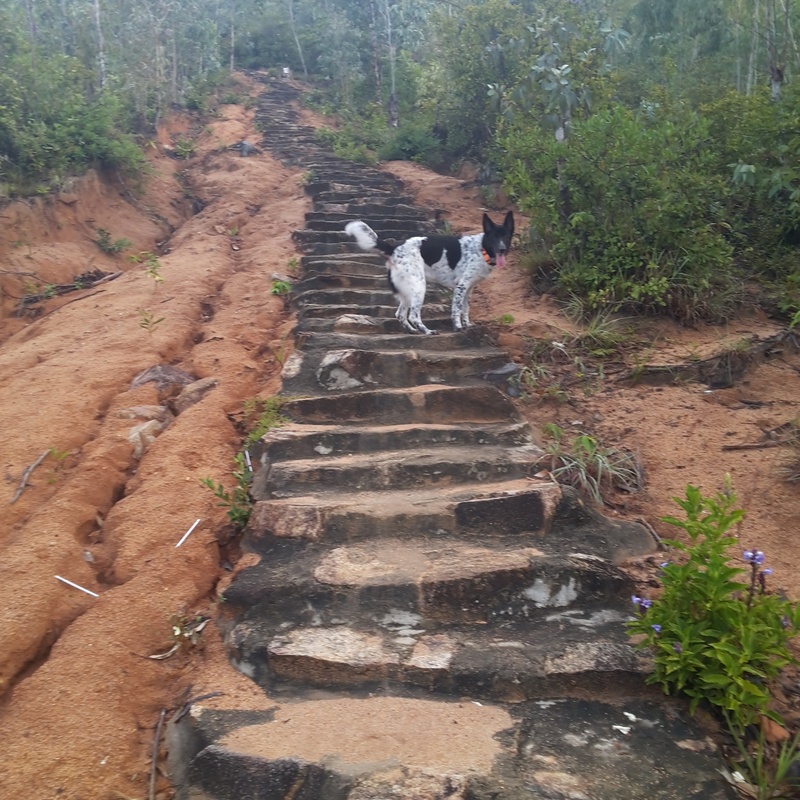 She had checked around and decided to go through Amazing Borneo for the climb. She did a good job choosing Amazing Borneo. They offer one of the more expensive packages but they have fewer complaints and more compliments than any other Mount Kinabalu tour company. My initial reaction was that at nearly US$400 a person somebody’s making a lot of money out of this deal. After some thought (and research), I decided that the price is actually pretty good value. Visiting climbers are the main source of income for Kinabalu National Park and the cost of keeping it running – staff overheads, trail maintenance, cleaning up, etc – must be rather high. The only way to drop the price is to allow more climbers and that would rather spoil the experience. The price, by the way, includes meals for the two days, overnight accommodation at Laban Rata Resthouse, fees, charges, permits, mountain guide and transport between Kota Kinabalu City and the Mount Kinabalu Park. Anyway, it was about then that I started seriously researching and training for the climb. As I digitally wandered around the Intertubes I collected pictures, links and random quotes as well as checking out hiking gear. I started keeping a few notes of my own, since I can be a bit scatterbrained at times. After a week or two I thought I may as well share my findings with the rest of the Kinabalu group. I started an informal weekly newsletter just to share what I’ve discovered and after newsletter number four I realised that it might be useful to make this available generally. Once again, hence this blog. The next few blog entries are mainly from emails I’ve already sent. I’ll be sprinkling it with quotes from other people’s Mount Kinabalu climbing stories as well as pictures if I can get permission to post them. One more thing. I’m a relative newbie at hiking and trekking, so a lot of what I write about will be obvious to those with experience. I’m likely to get a few things wrong since I’m writing about stuff that I have no experience with.